Got home from work today to discover this book in the postbox. I’d ordered it online just last week. Its a fantastic new book on the Beatles output on vinyl in Australia. When you say the words “in depth” they don’t really convey the work that collector and author Jaesen Jones has put into researching every aspect of the Australian arm of the mammoth EMI company as it relates to the Beatles output here. EMI Australia was responsible for releasing all the Beatles Parlophone and Apple label records in Australia. (The book also has information of the very few Polydor Beatle discs released here). An avid Beatles collector from Canberra (Australia’s national capital), Jaesen has really done a terrific job in pulling together a lot of relevant information about the Australian Beatles releases – some of them quite unique in the world. They toured Australia on a single occasion in 1964, but once was enough for The Beatles to claim the continent as an integral dominion in their global Empire and to forever assure record-breaking sales of their recordings. “An Overview of Australian Beatles Records” details Beatles records manufactured in Australia, from the first in February 1963 until the last in 1990, with emphasis on those distributed by EMI (Australia). It begins with a brief history of EMI (Australia) and its introduction of The Beatles to the people of Australia. It continues by detailing both the similarities and differences between EMI (Australia) and its parent, EMI UK, before focussing on the unique Antipodean pressings. The book describes local publishing arrangements, major record label styles, sleeve design, production outsourcing/contracting, mastering methods and official imports. Where possible, period EMI publications, newspaper clippings, press releases and people directly involved with EMI (Australia) and Festival have been consulted. For collectors there’s a section listing recommended Australian Beatles pressings, based on the views of numerous local and international audiophiles, as well as thirty-five pages of full colour label, sleeve and sticker scans (covering singles, EPs and LPs). Included are over 180 images, representing the most comprehensive collection of Australian Beatles record labels, outer and inner sleeves, inserts, and ephemera ever gathered together in a reference document to date. 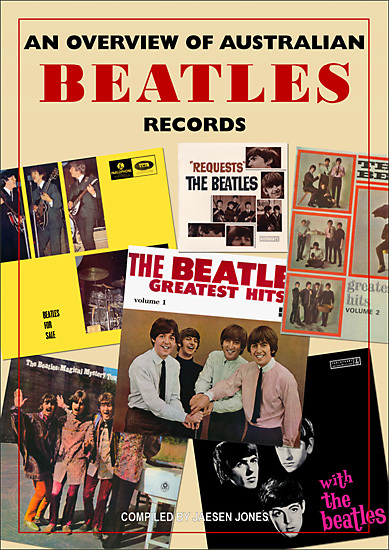 Also included is a record rarity guide that lists all known major Aussie Beatles record variations with their relative rarity. An Overview of Australian Beatles Records is an essential aid to the collector of Australian Beatles vinyl and is a book which will surely elevate the esteem in which this interesting subset of Beatles records is held in the global Beatles community. You can find out more at I Am The Platypus – The Beatles Australia Album Labelography – a huge online resource also covering Australian Beatles releases. This entry was posted in Apple Records, Beatles, Beatles Books, Beatles Collecting, Beatles Music, EMI Records, Parlophone Records and tagged Apple Records, Australian Beatles, Beatles, Beatles Books, Beatles Collecting, Parlophone Records by beatlesblogger. Bookmark the permalink. just to correct you, EMI Australia was NOT responsible for releasing all Beatles LPs in New Zealand. Thanks for that correction Ross. I have changed the text to reflect that. Cheers.